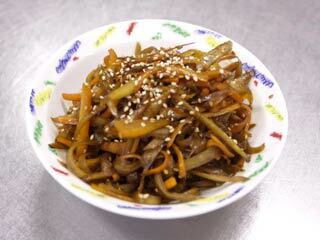 Kimpira Gobo is one of the popular daily dishes in Japanese food. It is made from cocklebur and carrot with soy sauce flavor. It is also popular appetizer for Sake. First peel off Gobo by rubbing up with scrubber. Then slice it to Sasagake style. Slice Gobo, just like sharpening a pencil. Then remove them into a bowl. Sink them into a running water for 10 minutes. This is a removing scum of Gobo. Peel of and slice it into small stick shape. Removed Gobo and drop water. Prepare a big pan, and heat it with strong fire. Let the water gone with strong fire. When they are well cooked add suger (1/10 of Gobo and carrot.). Add soy sauce (1/10 of Gobo and carrot). Once they all well cooked, stop the fire and add sesame oil. Cool it down, and that's it. That's it for Kimpira Gobo. Make sure cool it down before you eat it.